posted by Lisa Ace in Sponsored Post, advertisement, Eli Fish Brewery, Easter, Easter Brunch, food, dining, batavia. posted by Lisa Ace in Sponsored Post, advertisement, RCW @ Bohn's, dining, specials, batavia. posted by Howard B. Owens in Creekside Inn, Farmer's Creekside Tavern & Inn, Le Roy, news, business, dining, restaurants. A group of writers and photographers, mostly food and wine critics from Monroe County, were in Le Roy last night to be the first to experience Farmer's Creekside Inn. Ten years have passed since Bill Farmer, chairman of Catenary Construction in Rochester and a specialist in historical preservation of concrete and masonry buildings, saw the Creekside Inn for the first time. It wasn't a pretty sight. Three years earlier the Creekside had been destroyed by a fire people in Le Roy still talk about. "Part of it is the environment," Farmer said about what attracted him to buying and restoring the 200-year-old building. "It was a vision when I first looked at the building, and it was in dire shape. "It was collapsing. It was ravaged by fire. But I took a look at the environment, the setting, the historic structures that are across the creek, the composite of the village itself, the post office across the street, and I thought this was just an unbelievable setting that was unrecognized." He decided to set out and create a dining and hospitality destination that was second to none in Western New York. The preview dinner last night was the first time Farmer could see that vision start to come into focus in a meaningful way. There's still a lot of work to do on the interior of the building before Farmer's Creekside Tavern & Inn opens to the public on June 5, but Farmer said he has the right people in place to make it happen. "It’s really overwhelming-- this event, this private little dinner we hosted tonight was a culmination of a fast track of putting the kitchen together, hanging the final fixtures," Farmer said. "The floors are only three days old. It’s really a tad overwhelming to see it come so beautifully, full of life, and so many people here enjoying the experience and seeing the staff perform. I just feel so flattered and honored to have the staff we have." It's been eight years since The Batavian first paid a visit to the Creekside and met Farmer. We've dropped in several times over the years since and been impressed each time with the attention to detail; the quality Farmer is investing in the building. The new floors are real hardwood; the interior railings are oak, the fixtures are the highest quality and the amenities -- exterior patio and bar with a gas fireplace, a tavern, a fine dining room, guest rooms on the top floor -- are well thought out and designed. As the opening day approaches, it's clear Farmer has given the same attention to detail in hiring his staff, with Chris Grocki as general manager and Sean Wolf as executive chef. "I’ve always felt blessed by the people that I employ," Farmer said. "I've had people working for me now for well into a 30-year span. I value my employees. I recognize their efforts. It’s just so rewarding when you put together a good team, and they go out and execute the plan. That holds true with everything we do whether it’s real estate development or masonry and concrete services, masonry restoration services, and now it's going into our food and hospitality services." Farmer said he decided on Grocki and Wolf as his top leadership in the restaurant several months ago and said throughout the process he's convinced he made the right choices. During his opening remarks before the dinner, Grocki was equally effusive about his new boss. "Opening a restaurant is a labor of love, and we’ve got a family here that has no shortage of it," Grocki said, adding, "I’ve never had the pleasure of working for somebody who has gone for it in quite this way. You always say, 'You don’t do anything like anybody else does.' and clearly that’s true." One of the key people in helping the restaurant, tavern and inn come together so beautifully, Farmer said, was interior designer Jason Longo. Longo said Farmer was a special client. "Chris and I had worked on a project before, and I called Chris one night," Longo said, "and I was nearly in tears, and I said, 'I can't believe that in my career' -- which has been going on for some time now -- 'that I've ever worked on a project where people gave everything, from the carpenters to the electricians. Every single person who has worked on this project is so invested and so involved.' "
Farmer said he just had a passion for the project since the day he saw the building and has made sure he's had the right people in place to make sure the vision became a reality. "It seemed pretty clear to me when I came to the building, looked at the site, saw the surroundings, stone building, 200 years old almost, I hate to say it, but for me, it was a no-brainer to get involved in," Farmer said. "You’ve got to have a passion for it," he added. "I think that’s the driving force. I fell in love with this place. I fell in love with the building. The site. Part of the experience of rehabbing and building it and meeting all the challenges and solving all the issues are a great part of it." The dinner consisted of multiple courses loosely paired with wines, mostly from the Finger Lakes. It started with a ceviche of Alaskan halibut, bitter spring greens, truffle chicken, followed by a surf and turf and a dessert of foie gras. Wines included a Hermann J. Wiemer Blanc de Noir 2011, Ravines Dry Riesling Argetsinger Vineyard 2012, Palo Cortado 'Peninsula' Sherry' and a Benanti Etna Bianco 2015, among others. The idea, Grocki said, was to give guests a sample of what will be served in the tavern and in the fine dining room, known as the Cleveland Room, which will serve fine dining, destination, and special occasion meals four days a week. The fine dining room, the tavern, the patios, all told, will seat 400 people. Farmer thinks the Creekside Inn will become a destination location, drawing people from throughout the region, especially Buffalo and Rochester. "I had no idea initially how important of a project this would be, but over the years it’s become apparent," Farmer said. "I’ve realized this is a significant, significant project for Western New York, the Town of Le Roy, the county. It’s a very meaningful project, and I’m flattered and privileged to be that guy doing it." One of the inn's guest rooms. Bill's son, Bill, daughter Hailey, who will run fine dining, her son Ryder, and Bill Farmer. posted by Howard B. Owens in Batavia HS, Food Truck Rodeo, food, dining. posted by Howard B. Owens in batavia, dining, business, food, bill cultrara. Bill Cultrara and Larry Reisdorf are eager for the snow to clear from the smoker so they can get busy again with some serious BBQ. Reisdorf has owned and operated Duke's Smokin' Bone, a catering service, for about a decade, and with business growing, he thought Cultrara's experience and expertise could help kick things up a notch. Cultrara is a chef and former owner of Delavan's. "With his experience, I thought it would be great if we could team up and work together," Reisdorf said. Fans of Delavan's will be glad to see Cultrara cooking again, and happy to know Duke's will start offering his secret-recipe Italian sausage. "I saw this as a different opportunity, nothing I've ever done before, and I like to learn," Cultrura said. The new menu will include spatchcocked chicken and beer can chicken along with beef brisket and ziti and sausage (smoked or grilled). Duke's longtime favorites, quarter chicken, pulled pork and ribs, along with a several other meats, will also be available. Duke's is available for private parties, corporate events and graduations. For more information, visit Duke's Web site. posted by lucie griffis in dining, Le Roy, local shopping, LeRoy Winterfest, Dine & Win. For every $10 spent in purchases, gift certificates, and memberships at participating businesses you'll receive 1 entry into a drawing for prizes. Bring receipts to the Community Holiday Bazaar, 21 Bank St. LeRoy between 10am-3pm on Saturday, December 3rd to receive entries. SHOP & SUPPORT LOCAL BUSINESSES. posted by Tara Pariso in dining, entertainment, fundraiser, community events. Tomorrow, Tuesday January 12, 2010, Genesee COunty CASA for Children will be having a Pizza Hut "FUN"draiser. To show your support for CASA, all you have to do is pick up a coupon and eat in or take out from Pizza Hut tomorrow and 20% of the total sales will be donated to CASA for Children. CASA (Court Appointed Special Advocates) is a non profit organization that provides abused and neglected children in Genesee County with a trained volunteer advocate that monitors court orders, advocates for safe and permanent placement, and is a consistent positive person in the child's life. If you or anyone you know is interested in becoming a volunteer advocate, or donating to CASA for Children, please contact Tara Pariso at (585) 344-2550 x 2331 or [email protected]. There are always more children in our community that are in need of a CASA. posted by Howard B. Owens in tacos, restaurants, dining, margarita's, mexican food. During our years as residents in San Diego, my wife and I developed a strong preference for "street tacos". You might say, street tacos are a Tijuana delicacy. If you visit any town immediately south of the San Diego border, you can buy street tacos. Where you do you get street tacos? On the street, of course. In New York, you find hot dog stands on many corners. In Tijuana, there are taco stands. What they serve mainly are grilled steak (spiced and called carne asada), tomato, white onion and cilantro piled on two small corn tortillas -- adding anything else to a street taco is like making a martini with vodka instead of gin ... it's just not as good, not as pure (and absolutely forget chocolate or apple). A lime on the side is nice, but not required. 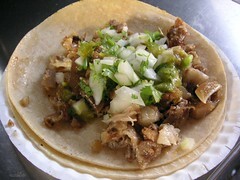 Of course, throughout most of California you can find many restaurants and taco stands that serve street tacos. In New York, not so much. That said, I'm very happy I found Margarita's. Here's one of the great things about Batavia (among many we've found so far) -- lots of family owned, non-chain restaurants. We've been to three of them so far (Margarita's, Jackson Street Grill and Central BBQ) and they've all been a treat. There's nothing particularly wrong with chains, of course. They have their place and serve their purpose, but nothing beats a good meal at an independent restaurant. Here's to hoping the city leaders act responsibly to protect Batavia's family restaurants. They are important to a community's identity and help give it it's own flavor. Leave your restaurant recommendations in the comments. I want to try them all.